Pregnancy is a stressful time for the mother, not just from the changes going on within her body, but also the affects these changes have on her body structure. The mothers evolving posture during the term is a perfect visual example of strains the body structure must cope with and is the focus of this article. Each of the above variables alters with each passing week and therefore will alters the mothers posture. Broadly speaking we can look at 3 main postural changes corresponding to each trimester. During the initial stages, the enlargement of the uterus pushes the abdominal organs upwards and outwards. This outward motion push against the abdominal muscles, which in turn contract to counter-act the pressure. As these muscles are connected to the pelvis it indirectly causes the pelvis to tilt backwards. Consequently [due to how the pelvis and lumbar spine interact] the lumbar spine loses its curve and becomes straighter (decrease in lordosis). At the same time the breasts are enlarging and this added weight pulls the upper body (or thorax) downwards increasing the mid back curve (khyphosis). 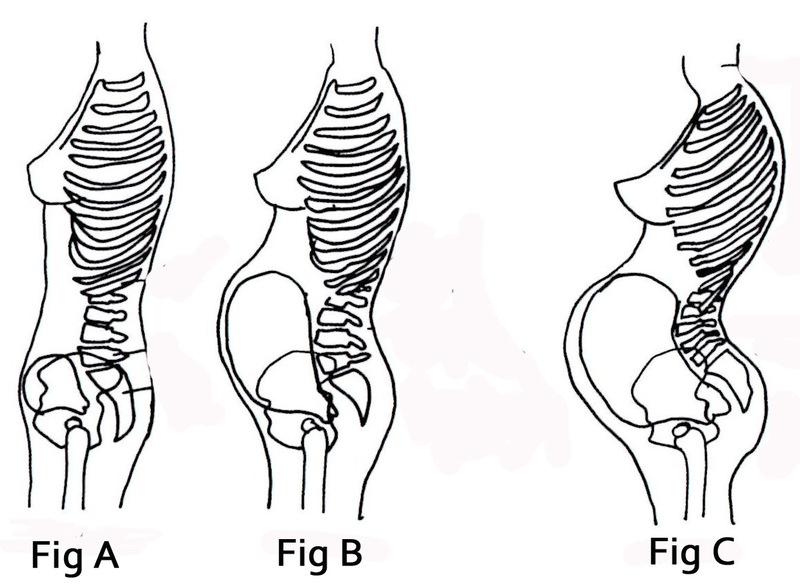 The resultant posture at the end of the 1st trimester is shown in fig A. As the baby and breasts grow in size and weight, this posture is exaggrated further. The production of relaxin at the start of 2nd trimester means the joints are more lax thus the joints yield to the pull more. Further exaggration of the mid-back curve leads to the lower neck coming understrain as it attempts to keep the head upright from the downward pull of the mid-back. 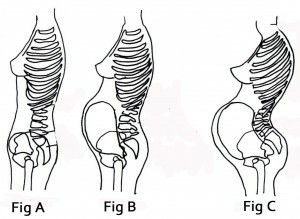 See typical 2nd trimester posture in Fig B. During the final trimester, the forward pull of the baby is greater than the abdominal muscles ability to counter act it. Thus, the pelvis actually tilts the opposite way causing the lumbar spine curve to increase. This is the main change in the 3rd trimester and can be viewed in Fig C.
By stretching the joints and muscles as well as effective advice and exercises, osteopathy can help restore some of the mothers adaptability. This ensures the pregnancy is easier and more enjoyable.